The sensory organs of gastropods (snails and slugs) include olfactory organs, eyes, statocysts and mechanoreceptors. Gastropods have no sense of hearing. 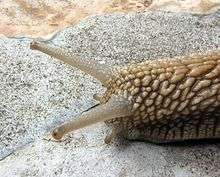 The upper pair of tentacles on the head of the edible snail Helix pomatia have eyes, but the main sensory organs are sensory neurons for olfaction in the epithelium of the tentacles. In terrestrial gastropods the most important sensory organs are the olfactory organs which are located on the tips of the 4 tentacles. 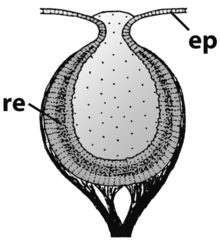 In opisthobranch marine gastropods, the chemosensory organs are two protruding structures on top of the head. These are known as rhinophores. An opisthobranch sea slug Navanax inermis has chemoreceptors on the sides of its mouth to track mucopolysaccharides in the slime trails of prey, and of potential mates. The freshwater snail Bithynia tentaculata is capable of detecting the presence of molluscivorous (mollusk-eating) leeches through chemoreception, and of closing its operculum to avoid predation. The deepwater snail Bathynerita naticoidea can detect mussel beds containing the mussel Bathymodiolus childressi, because it is attracted to water that has cues in it from this species of mussel. Some terrestrial gastropods can track the odor of food using their tentacles (tropotaxis) and the wind (anemotaxis). 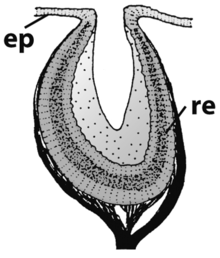 In terrestrial pulmonate gastropods, eye spots are present at the tips of the tentacles in the Stylommatophora or at the base of the tentacles in the Basommatophora. These eye spots range from simple ocelli that cannot project an image (simply distinguishing light and dark), to more complex pit and even lens eyes. Vision is not the most important requirement in terrestrial gastropods, because they are mainly nocturnal animals. 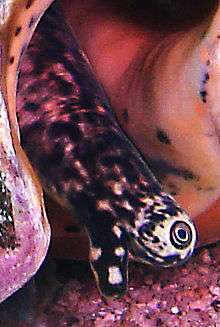 Some gastropods, for example the freshwater Apple snails (family Ampullariidae) and marine species of genus Strombus can completely regenerate their eyes. The gastropods in both of these families have lens eyes. Eye pit of patella sp. 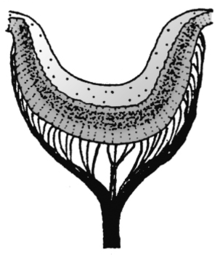 Eye cup of Pleurotomaria sp. Pinhole eye of Haliotis sp. Closed eye of Turbo coronatus. 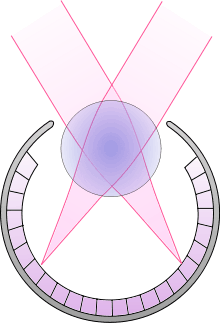 Lens eye of Bolinus brandaris. 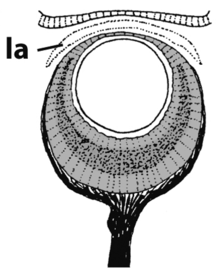 Lens eye of Nucella lapillus. 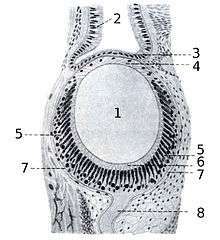 Drawing of cross section of the eye of Helix pomatia. 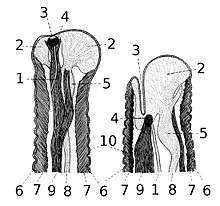 Drawing of cross sections of the extracted tentacle (left) and constricted tentacle (right) with and eye of Helix pomatia. Well-developed lens eye of Eustrombus gigas on eyestalk has a black iris. There is a small tentacle on the eyestalk also. In the statocysts of Haliotis asinina was found the expression of a conserved gene (Pax-258 gene), which is also important for forming structures for balance in eumetazoans. 1 2 3 4 Chase R.: Sensory Organs and the Nervous System. in Barker G. M. (ed. 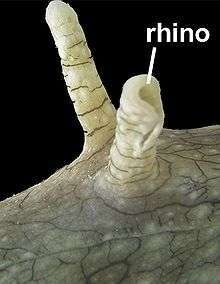 ): The biology of terrestrial molluscs. CABI Publishing, Oxon, UK, 2001, ISBN 0-85199-318-4. 1-146, cited pages: 179-211. ↑ Kelly, Paul M.; Cory, Jenny S. (1987). "Operculum closing as a defence against predatory leeches in four British freshwater prosobranch snails". Hydrobiologia. 144 (2): 121–4. doi:10.1007/BF00014525. ↑ Dattagupta, Sharmishtha; Martin, Jonathan; Liao, Shu-min; Carney, Robert S.; Fisher, Charles R. (2007). "Deep-sea hydrocarbon seep gastropod Bathynerita naticoidea responds to cues from the habitat-providing mussel Bathymodiolus childressi". Marine Ecology. 28: 193–8. doi:10.1111/j.1439-0485.2006.00130.x. ↑ Davis, Elizabeth C. (2004). "Odour tracking to a food source by the gastropod Meridolum gulosum (Gould, 1864) from New South Wales, Australia (Camaenidae : Eupulmonata : Mollusca)". Molluscan Research. 24 (3): 187–91. doi:10.1071/MR04008. ↑ Götting, Klaus-Jürgen (1994). "Schnecken". In Becker, U.; Ganter, S.; Just, C.; Sauermost, R. Lexikon der Biologie. Heidelberg: Spektrum Akademischer Verlag. ISBN 3-86025-156-2. ↑ Bever MM, Borgens RB (January 1988). "Eye regeneration in the mystery snail". The Journal of Experimental Zoology. 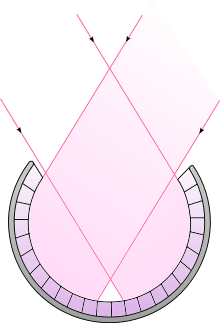 245 (1): 33–42. doi:10.1002/jez.1402450106. PMID 3351443. ↑ Hughes HP (August 1976). 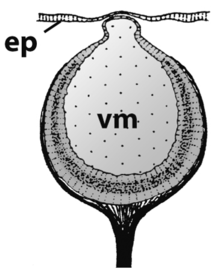 "Structure and regeneration of the eyes of strombid gastropods". Cell and Tissue Research. 171 (2): 259–71. doi:10.1007/BF00219410. PMID 975213. 1 2 Richter S, Loesel R, Purschke G, et al. (2010). "Invertebrate neurophylogeny: suggested terms and definitions for a neuroanatomical glossary". Frontiers in Zoology. 7: 29. doi:10.1186/1742-9994-7-29. PMC 2996375 . PMID 21062451. ↑ O'Brien EK, Degnan BM (2003). "Expression of Pax258 in the gastropod statocyst: insights into the antiquity of metazoan geosensory organs". Evolution & Development. 5 (6): 572–8. doi:10.1046/j.1525-142X.2003.03062.x. PMID 14984039. Sergei Tschachotin. 1908. Die Statocyste der Heteropoden. Heidelberg, Univ., Diss., (Zeitschrift f. wissenschaftl. Zoologie; Bd. 90; S. 343-422). Susswein, Abraham J.; Cappell, Mitchell S.; Bennett, Michael V. L. (1982). "Distance chemoreception in Navanax inermis". Marine Behaviour and Physiology. 8 (3): 231–41. doi:10.1080/10236248209387020. Wikimedia Commons has media related to Eyes of Gastropoda.